55,500 square feet of panels cast with SpecTilt 100! All-Phase Concrete Construction, Inc. presented a challenging tilt panel project. The contractor was tasked with placing and tilting 5-story panels on site. The lower panels were 62 feet, with the 5th level averaging another 18 feet. SpecChem provided the optimal solution, a system consisting of a bondbreaker and a curing compound, to meet the demanding requirements called for by the specifiers. 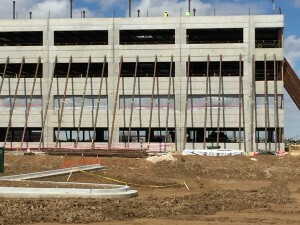 All-Phase Concrete Construction, Inc. cast and picked 65 foot-tall panels – with numerous window openings – with ease. The panel faces were smooth and tight. The project was so successful it was nominated for the TCA 26th Annual Achievement Awards. SpecTilt 100 is a chemically reactive tilt-up bondbreaker specially engineered to provide a clean, easy lift of tilt-up panels. SpecTilt 100 contains no diesel, kerosene, waxes or silicones.